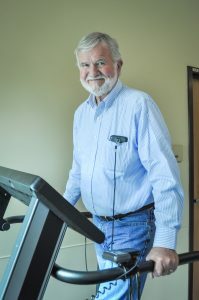 Jonesboro, Ark., January 25th, 2019– The Cardiac Rehab team at NEA Baptist announces success from their 12 week Peripheral Vascular Disease Rehabilitation Program (PVD). Patients diagnosed with Peripheral Artery Disease (PAD) may benefit from the program and its, Supervised Exercise Therapy (SET), recently approved by the Centers for Medicare and Medicaid Services (CMS). Dr. Efeovbokhan, Cardiologist for NEA Baptist Cardiology Clinic, notes that one of her patients, Mr. Tom Baker experienced exceptional results from the PVD Rehab program. Mr. Baker suffered from swelling in his toes with painfulness and cramping in his calves while walking. Results from Baker’s computed tomography angiography (CTA) scan showed blockage in his lower arteries. Dr. Efeovbokhan ordered PVD Rehab. PVD Rehab helps to prevent invasive procedures when a patient suffers from intermittent claudication or pain when walking. On average a patient will attend three days a week for an hour each session. If a patient attends all 36 sessions they will graduate from the 12 week program. During the program patients are evaluated and treated by registered nurses. SET includes treadmill and exercise bike training until the point of pain or intermittent claudication. Patients will have a period of rest and then continue, building up the patients’ endurance over time. “Before the PVD Rehab, I could not walk very long without stopping. Now I try to walk at least 2 ½ miles every day,” said Baker. Research from the American Heart Association and the American College of Cardiology shows SET to be an effective, minimally invasive method to alleviate the most common symptoms associated with Peripheral Artery Disease (PAD). SET is significantly more effective than unsupervised exercise, and could prevent the progression of PAD and lowers the risk of cardiovascular events. SET performs as well as other invasive revascularization treatments. In May of 2018 Medicare revised the payment approval of SET, stating that it must be conducted in a hospital, outpatient setting or a physician’s office. Patients will need a referral to participate in the PVD program, and it is diagnosis specific. Patients suffering from leg pain would need to see their primary doctor or a cardiologist to see if SET would be the best treatment. Dr. Efeovbokhan graduated medical school from Obafemi Awolowo University in Ile-Ife, Nigeria. She completed her residency at Michigan State University in East Lansing, Michigan and her cardiolovascular disease fellowship at the University of Tennessee Health Science Center in Memphis Tennessee. She went on to do a fellowship in Interventional Cardiology at the University of Florida, Jacksonville. Dr. Efeovbokhan holds professional memberships in the American College of Physicians, American College of Cardiology and the American Medical Association. Patients and providers seeking more information about the PVD program can contact Joyce Lemieux at joyce.lemieux@bmhcc.org or by phone at 870-936-2036. NEA Baptist Cardiac Rehab holds accreditation by the AACVPR (American association of cardiovascular and pulmonary rehabilitation). It is the only peer reviewed accreditation process designed to review individual facilities for adherence standards and guidelines developed and published by the AACVPR and other professional societies. 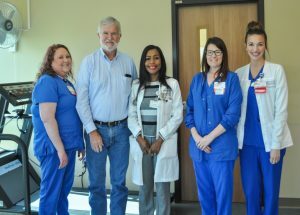 In June of 2018 NEA Baptist met the standards set by the American College of Cardiology’s NCDR Action Registry Achievement Award program for patients experiencing myocardial infarction (heart attack). The Action Registry recognizes participating hospitals who have demonstrated sustained, top level performance in quality of care and adherence to the American College of Cardiology guidelines and recommendations. NEA Baptist is one of only 95 hospitals nationwide to receive the honor of the Silver Performance Achievement Award for 2018.